Gently yet effectively washes away surface impurities to rinse clear, leaving your skin nourished, soft and smooth. I love this soap. I started breaking out after wearing makeup more often. Switched to this and my face began to clear. With the Shea butter that prevents my face from feeling dried out. I have to moisturize but I've noticed I don't have to apply as much. It's great with removing my makeup as well. Glad i made the switch. Written by a customer while visting influenster.com. I like it. Its not too expensive like most soaps. It has a light scent and it makes my skin soft after my shower. I love this soap I always wanted to try it makes your skin clean and smooth I would love to try this product out. This soap smells so nice,and it's so perfect for sensitive skin or acne prone skin like mine, It cleanses your skin so well and doesn't irritate the skin at all. I love black soap. This is the holy grail when it comes to getting rid off any toxic, blackhead, or just acne problems you have. I only use this once in a while because it do strip your face from everything. I definitely would recommend this product to anyone. Its been a long time since my skin has looked this good! I first used this product not expecting much but am so glad i stuck with it! After ONLY a week of use my skin had completely cleared up. Im so grateful for this soap. 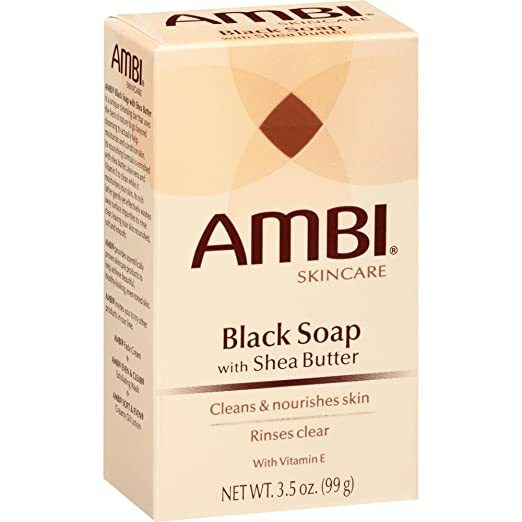 I have use this family black soap for more than 5 plus years now and I have let my teenage daughter use it for about 6 months now and I have already seen a difference in her skin. The only thing that I do not like so much about the soap is that if you get it in your eye it does seem to burn quite a bit but the product works so very well it's worth it. I love this product I use it for my face. It's not harsh but gentle. It's very inexpensive and it last a long time. Keeps my face clean I can tell the difference after I wash with it. The soap is good for those with oily skin and I mainly use it every morning and night. The price is VERY good and affordable. It's not for EVERYONE so please keep that in mind when buying it. I would definitely buy is again because it worked very well with my skin. Best product to use if you have acne and acne scares I swear buy this black soap...my skin have never been this flawless, even toned and clear. I brought this soap on a whim because I could not find the black soap that I usually use. This soapIs incredible. The scent in neutral, however, my face get CLEAN. I have used it for my entire body and I am soooo impressed. I will continue to use this soap as a part of my beauty regimen. For all my chocolate girls out there... if you need clear skin with a moisturized finish, this is the soap to use. It cleans very well and is soothing. My skin is very sensitive but it doesn't irritate my skin! I recommend it! It's pretty cheap as well. I got mine from a local dollar store. I use this soap to was my face before applying makeup and it is gentle to the skin. It is a great value and very affordable. It smells good and I love using it. I would buy this soap again because I love it. Yesss for the glow. I like this one better than the complexion bar. It isn't as drying . I would wash my face with this at night and in the morning. Will buy again.. plus it's inexpensive. I use this bar soap for my face and I love the way it makes my face feel after I've washed the soap off. My skin feels clean, tight and moisturized. I use this twice daily in the morning, and at night to wash the day away! Definitely would recommend this! I just starting trying this and I like it. Gonna keep using it and watch the results. It helped keeps my skin radiant and isn't too harsh. It's amazing and keeps my skin looking beautiful as ever. This unique facial bar gently cleanses and moisturizes skin. Facial bar appears black, but rinses clear as it moisturizes and effectively washes away surface impurities. Enriched with shea butter, aloe vera, and Vitamin E, it leaves skin naturally nourished, soft, and smooth. Wet face, lather soap and massage onto skin. Rinse well and pat face dry. For external use only. Avoid contact with eyes. Rinse with warm water to remove.